The Cardiff Rugby Digital Archive is a collection of memories, mementos, reminiscences and records. Bringing Cardiff’s unique rugby heritage to life, it aims to capture, preserve, celebrate and share over 142 years of history. This online only archive features over 100 caps with a range of examples from club, county and country teams around the world. The description of each picture includes a reference to the Cardiff Rugby Museum (CRM) and a the Object ID number on the site itself to assist with any search you may want to do on the site. 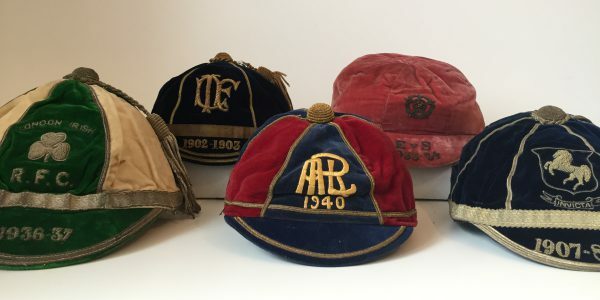 The Archive contains a record of each item of rugby memorabilia owned by Cardiff RFC and Cardiff Blues together with items that are either on loan or in private collections. It also provides a summary of results and reports from each season from 1876, and copies of programmes from famous and lesser-known matches. Most memorabilia owned by the club are currently in safe storage, but our ultimate aim is to have all this on public display at Cardiff Arms Park. In the longer-term, the archive will be expanded to include player and supporter oral histories, educational materials, and much more. Remember these photos are only of the caps. The selection of other rugby related items, and the information that goes with them is impressive.